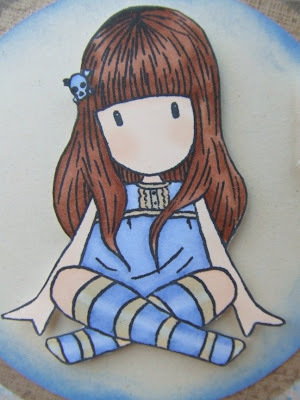 The image is one of Sugar Nellie's Gorjuss Girls #2, coloured with Promarkers. The Sentiment was computer generated. Teri soooo adorable!!! OH my girl she is SOOO CUTE!!! You rocked the mojo sketch and your coloring WOW beautiful! This is just so soft and adorable. Your colouring is just beautiful! Beautiful creation, love the colours used. What a beautiful card!! love those soft colors and your coloring is fantastic. Great job on such a Great card!! Lovely card Teri, the DP is gorjuss. Hope you are OK. So sorry I haven't been visiting for a while, just been snowed under. 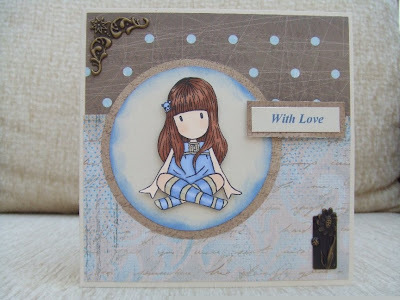 Your card is absolutely gorgeous, I love the scrummy papers you have used and such a lovely colour combo. Beautiful card, wonderful job using the sketch. I love the Mojo monday card you have created i think its amazing thanks for leaving me that lovely comment. Your card is lovely Teri, I know what you mean about Mojo Monday sketches they are fab, not to much on them, I love the colours you have used on your gorguss girl, I just love these stamps anyway!